This is the first in a series of informational releases planned by the Meta Focus Group, to help provide more detail and transparency about game mechanics. All releases will be approved by the Dungeon Boss team, and will address topics requested by the community that are relevant to PVP strategy or meta. For example, in future posts we hope to provide specific values for hero abilities beyond what is available in-game. Thanks to @Eej, the DB team, and the MFG for their work on, and support of this project! 4. Damage calculations used for the above priorities are based on comparing the damage of the attack--considering the attacker's ATK and DMG stats, as well as multipliers from the ability itself--to the defender's DEF, Health, and DR from 1st-3rd rune stats. Multipliers from casters' Mystical, other status effects such as Fear, or conditional modifiers such as "% damage reduction from" (4th stats on runes) are not considered in the calculation. The AI will choose a predictable target some of the time. Knowing which defender is most likely to be targeted can be helpful versus strong single attackers such as Shade. For example, lead-off Shade often picks Emily as a primary target in PVP, even when she is equipped with enough DR to take minimal damage from his attack. This is because Emily is a light hero, often does not have the most health on the team, and because the "% damage reduction in PVP" value from her runes' 4th stats is not included in the calculation. 2. After taunt (or if none), the leftmost hero in the attacker's lineup will be hit. This is not the order of combat, but the order in which chosen at the hero selection screen. 3. The rest of the hits proceed in a left-to-right manner based on the attacker's order from the hero selection screen. Putting Kobal in the far left slot will make him the first target, to immediately disease the defense upon his death. Similarly, a weak reptile to the left of a gorgon can provide a better chance for the gorgon to gain invincibility. 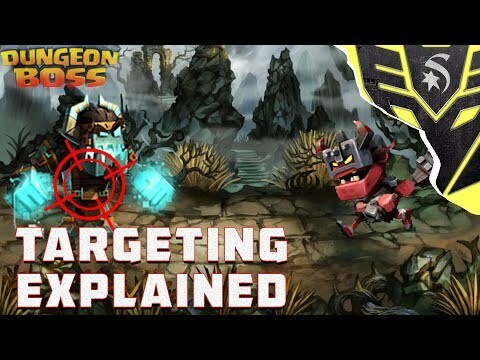 When the offense attacks with an AoE, the first target hit is the one chosen by the player (attacker). Subsequent hits proceed in an order which is randomly determined at the beginning of a battle, but remains consistent for that battle. There is no good way to predict who to aim for so that Kobal or Zen are hit last with an AoE, unless you pay close attention to the order of another AoE first. just a point of clarification, is this AI exclusive to PVP, or is the same AI attributed in PVE also? There must be some sort of unseen modifier between mobs, because i've seen hansuke attack a bat (same level as another bat), even though the other bat is lower on the screen, and lower attack order as soon when they start the attacks. can these be confirmed as "rules"? or still just possibility, since there's always RNG? I have only noticed this when it comes to Torchy, so i'm not sure if it's limited to him? or more widespread. when auto running with torchy. he will often not attack the one with elemental advantage, in fact, will often attack one that is full health when there's others with lower health. Thanks for your feedback, Oredith! Unfortunately, I can only confirm this is the logic used by the defensive AI in PVP. This logic may not apply to PVE autorun for your teams. But happy to look it the possibility of that topic in the future. Made a video version of @D_Rodd writup above. I'll ask if we can get this stickied. @Starskream I'm glad to see you're still making DB videos. Thanks to you and @D_Rodd for sharing this information with the community. One question: 853 raid tickets?!? Half of me wonders why it's so high; half of me wonders if it maxes at 999. Thanks for the update! the AOE attack info is helpful, especially confirmation of the attack order after the taunter. kinda irritated by the lack of firm logic on attack side AOE though. the dead hero zen-revenge is annoying. AOE is not AOE: it's a sequential attack on all enemies. Knowing the order in which AOE attacks proceed is useful but it's a bandaid on a bigger issue: passive death traits like Zen's or Kobal's shouldn't activate until the AOE attack is finished. Koros can also revenge an attack where he died but then was ressurected by Leonidius. Nice post. I believe some of this, if not all, is also applicable in PvE. I've noticed when playing around with using Dagrund's EMT that as you permanently boost weaker heroes, they are targeted less. The lowest health hero changes as EMT is applied, thereby changing the attack preference by the enemy. There is a random factor as well, as they don't target the lowest health player 100% of the time. Where are you in PvE? Because I guarantee you Nornal and Boss Mode enemies don't have a method to them, I've had a hero by a sliver from death and they all seem to ignore them. In challenge mode, however, it's very clear enemies target one hero at a time until they're dead. It does not max at 999.